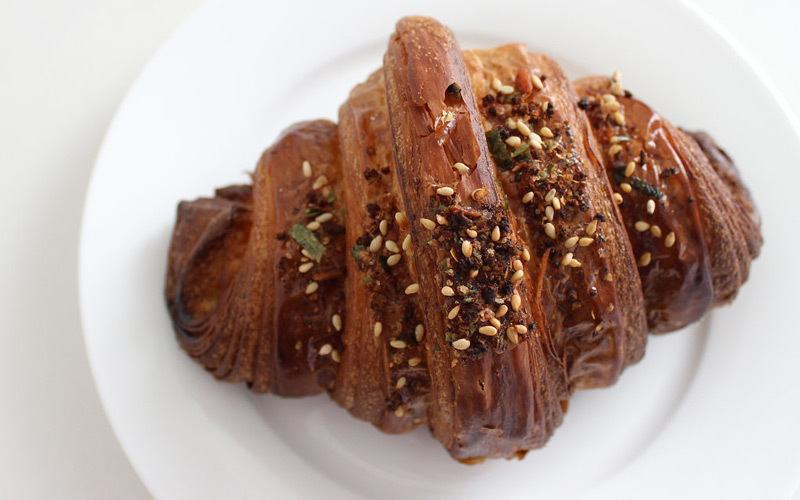 Home Dining The 10 Best Upgraded Croissants in L.A.
Facts are facts: Croissants are a thing of beauty. We salivate at the mere thought of the buttery French pastry, with stacks on stacks of shatteringly crispy, paper-thin layers. While the purist in us loves a good old-fashioned plain, chocolate, or ham-and-cheese, there’s that other side of us that can’t help but crave something new every now and then, something extra. If you have been known to dip a croissant in matcha and chocolate, or shower everything-bagel seeds on it like #saltbae, then you know of the desire of which we speak. Mr. Holmes Bakehouse is already working its wizardry with its very Instagrammable fusion dessert, the cruffin, but what piqued our interest the most is its umami bomb of a pastry that’s stuffed with smoked salmon, spicy wasabi, pickled ginger and nori, and served with a side of soy sauce for dipping. With L.A. being such a sushi and poké hub, it was only a matter of time before this “California Croissant” crossover happened. Just as quickly as the poké and avocado-toast trends have taken over, so has the ubiquitous matcha—and Mr. Holmes Bakehouse’s matcha-croissant hybrid steps into that craze. This one takes what we love most about the croissant and adds a special touch, dipping half of a perfectly crisp and doughy croissant into matcha and white chocolate. Sugarbloom Bakery’s Sharon Wang has gifted us with upgrades on two classics, the SPAM musubi and the humble croissant. In her Hawaiian-meets-Korean-meets-French pastry, which can be found at several cafes in L.A., she stuffs the rich dough with a slice of SPAM, punches it up with a kimchi puree and Sriracha, and delicately adorns the golden crust with sesame seeds and strips of nori. The reuben sandwich has been around for about a century, and while it’s already perfect as is, Superba’s twist on the deli favorite is a welcome addition. This one takes rye bread out of the equation and replaces it with a flaky croissant, rolls it with pastrami and cheese, and then tops it with rye-and-sesame seeds, and a dollop of sharp mustard. The Everything Croissant is such a genius idea that it surprises us that we never fantasized about its existence until Superba started baking it. Instead of chewy bagel wheels, this version opts for crackly layers of dough filled with cream cheese, showered with savory seeds. Instead of exhibiting restraint by noshing on just a little filo square of baklava, we get to indulge in our carb cravings with Gjusta’s larger Baklava Croissant, where chopped pistachio nuts and honey are rolled into the sheets of this crunchy baked goodness. Sometimes it’s the little things. Like Cake Monkey’s simple addition of sage into a conventional cheddar croissant. If you’re lucky, you’ll get one that oozes out a thin layer of baked, crispy cheese. Alfred Tea Room offers an elevated matcha croissant made exclusively by Sugarbloom Bakery. This rendition gives matcha hounds a double dose of the Japanese green tea, with a matcha-almond cream inside the roll, and jade powder and sliced almonds on the outside. It’s hard to choose from La Monarca’s sea of delicious Mexican pastries, but if we had to pick just one, it would be its update on an old favorite: a ham, cheese, and chipotle chewy croissant square accompanied by a side of green salsa for dipping. The folks behind Valerie Confections have the golden touch when it comes to baking, and that means their croissants have that je ne sais quoi as well. In its upgraded version, salted caramel is folded into an airy and puffy croissant. Previous articleThat Proposed 710 Tunnel Under South Pasadena Is Dead. Now What? Next articleThe 4 Most Underrated Shopping Streets in L.A.